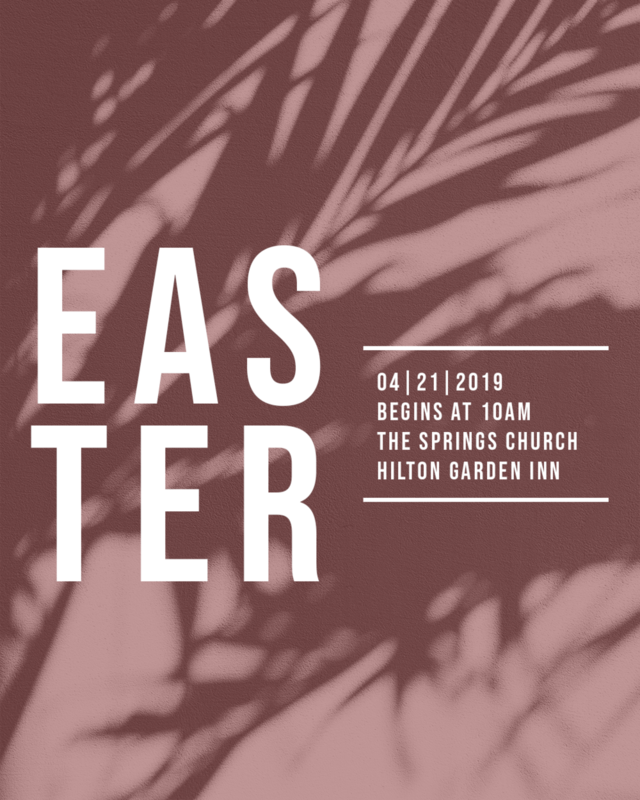 You're invited to Easter at The Springs Church. We are so excited about Easter this year and have an amazing day planned for you, your friends and family. Not only will you experience amazing worship and a life-giving message, but we will also have an opportunity for some fun family photos. This weekend at The Springs will be exciting, casual, and relaxed. You’ll be warmly greeted outside and directed towards the entrance. Then make your way to a seat and prepare for a high-energy and uplifting Worship Experience as well as a relevant, engaging message from our Pastor, Brian Mallette. The Springs Kids is a children's ministry uniquely designed with your child in mind! This weekend all children (3 months through 5th grade) will experience safe, age-appropriate environments where the Bible is taught in a creative and relevant way. Our team will meet your family and assist you through our secure check-in process. The Springs Kids is a fun, safe and learning place for all kids. If you are a guest, we will not embarrass you, have you stand up, or ask you to give money. We know that many people want to check out the church and “be anonymous” for awhile—and that’s fine with us! We would love to offer you a special gift for being with us. Simply drop by the Welcome Center and we can answer any questions you may have. Come in, enjoy the relaxed atmosphere, and see if this is the church for you.